Spokane is the second largest city in Washington and the largest city between Seattle and Minneapolis. It’s the smallest city to host a U.S. Figure Skating National Championship event and the smallest city to host a World’s Fair (Expo 1974). It’s loaded with both indoor and outdoor activities and many special events each month of the year. The summer months offer diversified events such as Art Fest and Per Fest in June, Spokane Swap Meet, Skyfest and Dragon Boat Race in July, and Bluewaters Bluegrass Festival and a Northwest Indian Pow Wow in August. 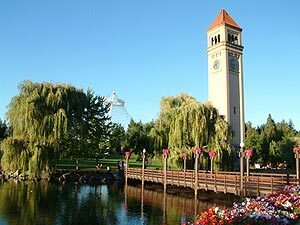 A sample of off-season events include Spokane Symphony Labor Day Concert, Spokane Interstate Fair and Valley Fest, Octobrewfest, Fall Folk Festival, Christmas Arts & Crafts Show, National Boat Show, Premier Home Show, Bloomsday Lilac Festival and Battle of Spokane Falls. Interested in visual, performing and classic arts? Facilities include Bing Crosby Theater, Center Place INB Performing Arts Center, Spokane Convention Center,Spokane County Fair & Expo Center and Spokane Veterans Memorial Arena. Love winter sports? Try 49 Degrees North, Lookout Pass, Mt. Spokane, Schweitzer Mountain or Silver Mountain. Awesome snow, long runs and night skiing delight skiers. Golfers find plenty of courses to choose from. About thirty of them are a short distance from the city. Besides those in town there’s Liberty Lake or Sandpoint, Worley and Post Falls, Idaho. Hikers and bikers appreciate the uncrowded trails at Spokane State Park, Route of the Hiawatha, Trail of the Coeur d’Alenes and Camfield Mountain plus the five ski areas mentioned previously. Near the downtown area stroll parks like Riverside State Park and Riverfront Park. Here the view of Spokane River Falls is outstanding. Many people like the winery tour called Grape Expectations. A number of wineries with tasting rooms are right in town. To find excellent accommodations and hundreds of good places to eat, learn the districts in this region. There’s Downtown, Browne’s Addition, Peaceful Valley, West Central, Logan, University, East Central and South Hill. Further out discover Airway Heights, West Spokane, Sunset Hill, Spokane Valley, Liberty Lake and North Spokane. Spokane, an inland Northwest wonder, takes pride in its 260 days of sunshine and the 37-mile Centennial Trail available to strollers and joggers along the Spokane River ending in Idaho. As for water, how about the 76 liakes that are only an hou’s drive away? You can state a white water raft experience just minutes away from your hotel or motel. Spokane is an excellent location for travelers to investigate three states (Washington, Idaho and Montana) plus two Canadian provinces, Alberta and British Columbia.